there is nothing like this time of year. i want to wrap this time in my arms and never let it go. hot spiced cider has happened. i've thought a lot about how much i love presents. i've seen a group of slutty reindeer ladies leaving a liquor store. fireplaces burning everyday and holiday inspiration coming from all angles. looking up at fireworks with my favorite people as we swig champagne from the bottle and watch young teenagers gaze into each other's eyes. ah. the amount of love swirling around this time of year is almost too much for my brain to handle. <but it's magical!> wouldn't you agree? a tart. the perfect vehicle for most things, especially when there is a hidden layer of goat cheese nestled in the crust. it starts with a crust made of almond meal and rosemary, bound with eggs and clarified butter. 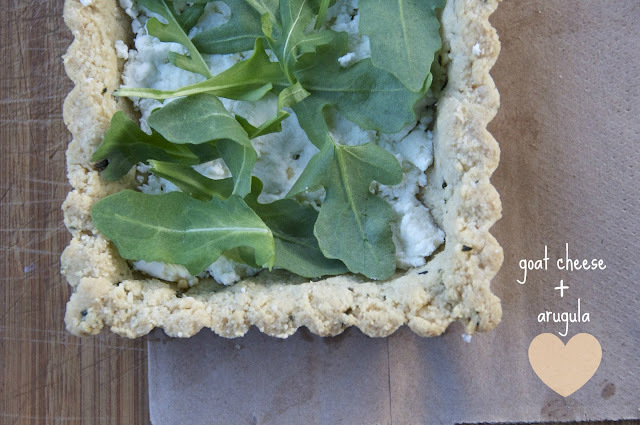 the cooled tart shell is spread with goat cheese and topped with arugula. and then the grapes! i love these grapes. roasted with red pearl onions, balsamic, and bay leaves. it makes a delightful appetizer, with wine, cut into slivers. or why not for dinner, next to a mountain of leafy greens. AND this tart is totally gluten-free. so for those of you who don't get down with gluten, i love you too, i'm just learning and easing my way into these kinds of things. more tarts! more goat cheese! more grapes! more love and wine! *i used an 14x4.5" tart pan and had enough dough leftover for a couple mini tarts or some flatbread. 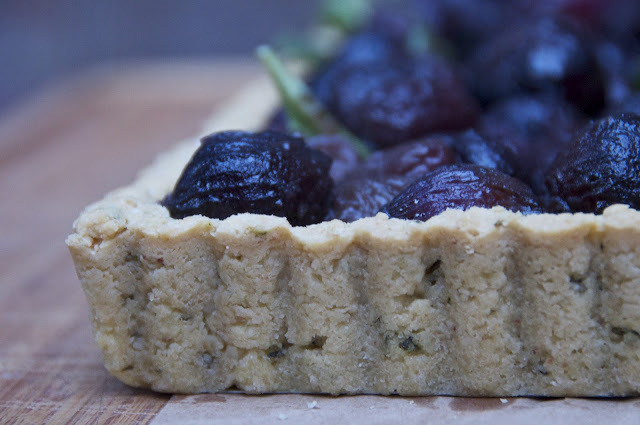 i imagine it would work perfectly in whichever tart pan you prefer, rectangular or circle. to make crust: preheat oven to 350. in a bowl combine almond flour, herbs, salt, and baking soda. add clarified butter and eggs and mix until incorporated. either pat into a ball and roll out dough between two sheets of parchment, or simply press crust into tart pan, about 1/4 inch thickness. dough will be more wet and crumbly than a standard tart dough. bake crust for 12-15 minutes, remove from oven, and then let cool. preheat the oven to 425. blanch the onions (unpeeled) in boiling water for 2 minutes. drain and transfer to an ice bath, and then peel them and cut off the root ends. bring onions, vinegar, and water to a simmer in an oven proof heavy skillet with the butter, sugar, bay leaf, 1/2 tsp salt and 1/4 tsp pepper, stirring until the sugar has dissolved. cover and simmer for 3 minutes. uncover skillet and transfer it to the oven. 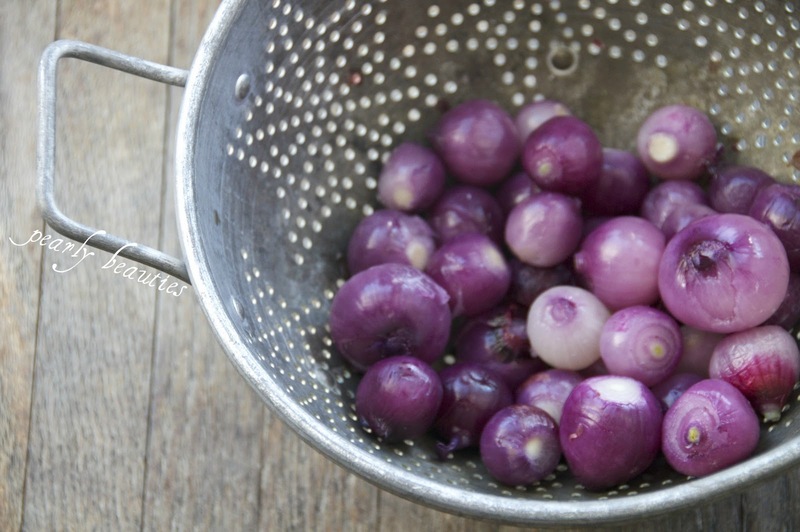 roast onions, stirring once or twice until most liquid has evaporated (15-18 minutes). 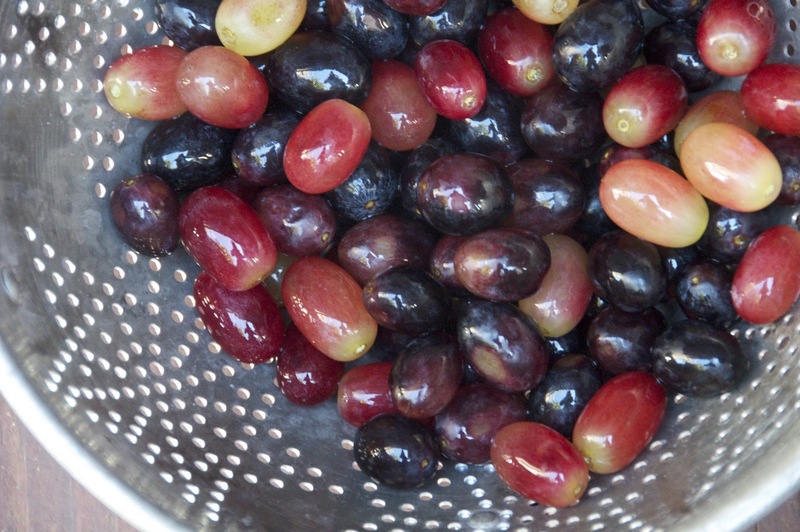 stir in the grapes and roast, stirring once or twice until the liquid glazes the onions and grapes, about 8-10 minutes. let cool a bit and discard bay leaf. 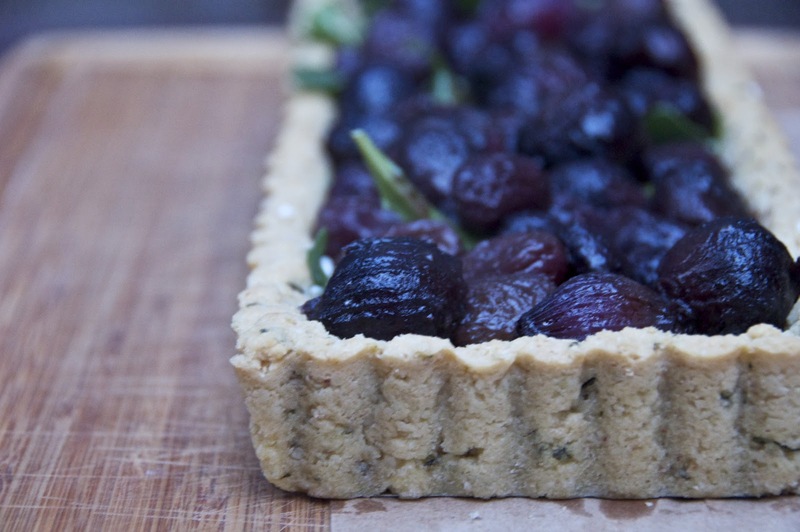 to assemble tart: spread goat cheese in the bottom of the cooled crust. arrange few handfuls of arugula over the goat cheese. then, spoon grapes and onions over and drizzle a bit of the extra glaze over. serve at room temperature or warmed in the oven! 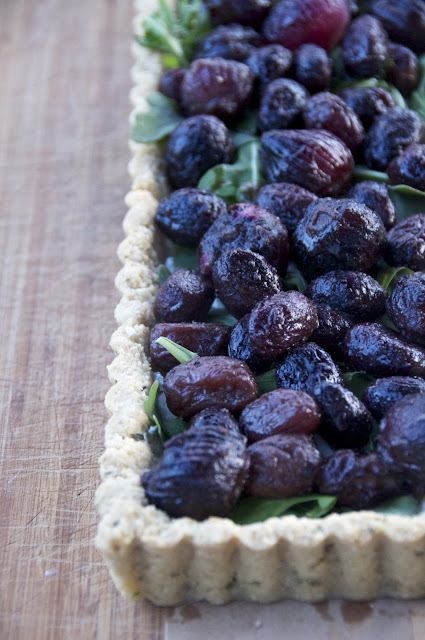 *depending on the size of your tart, you will most likely have leftover roasted grapes and onions. this is a bonus! they are delicious with crusty bread, tossed in a salad, or paired with any roasted meats. Oh wow, this is just gorgeous! I love all he savory sweet goodness going on here. 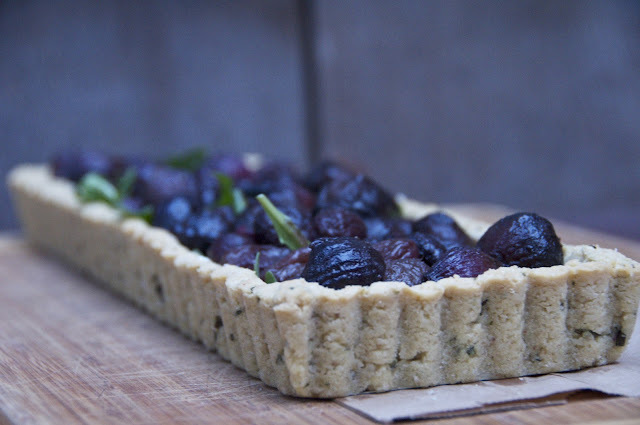 The tart looks stunning! 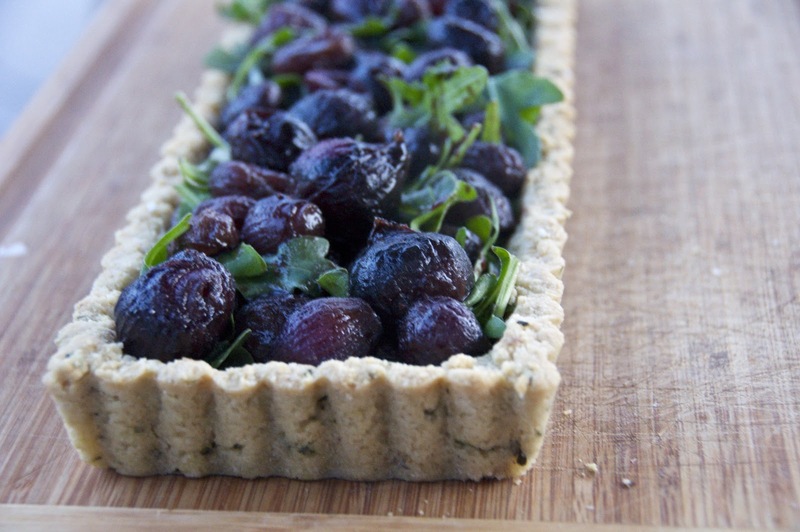 A delicious savory tart, how perfect! Ah SantaCon...I assume that's where you saw the slutty reindeer women. I hate SantaCon. Seeing as how it made me stand in the cold waiting a HALF HOUR to find a cab on Saturday. Yuck. Yum to this tart though! I love the mix of sweet and savory! Julia your food always looks so beautiful and delicious!! I made some of your cookies yesterday and they were bomb.com, this amazing tart will be next. Yumm! ah! thank you soo0 mUcho! im sohappy you are making things!